The Butcher of Beirut: On the death of Ariel Sharon – War Criminal, Ethnic Cleanser and Mass Murderer. as you will no doubt be aware, Ariel Sharon – the Butcher of Beirut – has died. In the wake of his death, we are now seeing widespread attempts both in Israel and internationally to rehabilitate and whitewash his actions and legacy. Sharon has been described by various mainstream media outlets as “flawed”, “controversial”, “complicated” and even a “peacemaker” and “hero”. Ariel Sharon, however, was none of these things. Ariel Sharon was a mass murder, who was responsible for the death of up to 3000 Palestinians in Sabra and Shatila refugee camp in Lebanon in 1982. He was a mass murder, who was responsible for the death of 70 Palestinians in Qibya in 1953 and many more in Jenin and across the West Bank in 2002. Sharon was a mass murder who was responsible for the death of thousands of Palestinians over several decades. He was a racist, an ethnic cleanser, genocidist and war criminal. Ariel Sharon died without facing justice for his role in the massacres of hundreds and perhaps thousands of civilians by Lebanese militias in the Sabra and Shatilla refugee camps in Lebanon in 1982. The killings constituted war crimes and crimes against humanity. While Sharon’s human rights abuses and war crimes are legion, it is the massacre of unarmed Palestinians in Sabra and Shatila refugee camp which he is most infamous for. In 1982, supposedly in retaliation for the attempted assassination of the Israeli ambassador in London, Israel invade Lebanon. The assassination attempt, however, was not carried out by Arafat’s PLO but by a rival militant group. Israel, who wanted to oust the PLO from Lebanon, used the attempted assassination to launch an invasion supposedly in the name of destroying the PLO. On 6 June 1982, under the direction Israel’s Defence Minister, Ariel Sharon, the Zionist state began its invasion and occupation of Lebanon, sending in more than 60,000 troops. In the wake of the assassination of Lebanese President, Bashir Gemayel, who was killed by a member of the Syrian Nationalist Party, Israeli troops surrounded the twin refugee camps of Sabra and Shatila on September 15. Commanding officers from Israel’s Occupation Forces (IOF) were stationed in a number of highrise buildings, allowing them a panoramic view of the two camps for the next three days. From September 15 through to September 16, Israel carried out non-stop shelling of the two camps, which was home to 20,000 unarmed Palestinian refugees. On the afternoon of September 16, 150 Christian Phalangists, trained by and under the direction and control of the Israeli forces, entered the camps. The Israeli military cordoned off the camps ensuring no-one could escape. 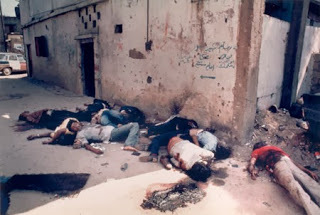 For the next 40 hours, with the full knowledge and cooperation of the Israel military, the Phalangist forces tortured, brutalised, raped and massacred the unarmed inhabitants of Sabra and Shatila. “Jenkins and Tveit [fellow journalists] were so overwhelmed by what we found in Chatila that at first we were unable to register our own shock. Bill Foley of AP had come with us. All he could say as he walked round was “Jesus Christ” over and over again. We might have accepted evidence of a few murders; even dozens of bodies, killed in the heat of combat. But there were women lying in houses with their skirts torn up to their waists and their legs wide apart, children with their throats cut, rows of young men shot in the back after being lined up at an execution wall. 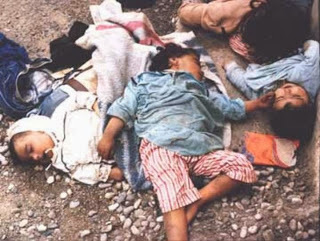 There were babies – blackened babies because they had been slaughtered more than 24-hours earlier and their small bodies were already in a state of decomposition – tossed into rubbish heaps alongside discarded US army ration tins, Israeli army equipment and empty bottles of whiskey”. “Down a laneway to our right, no more than 50 yards from the entrance, there lay a pile of corpses. There were more than a dozen of them, young men whose arms and legs had been wrapped around each other in the agony of death. All had been shot point-blank range through the cheek, the bullet tearing away a line of flesh up to the ear and entering the brain. Some had vivid crimson or black scars down the left side of their throats. One had been castrated, his trousers torn open and a settlement of flies throbbing over his torn intestines”. “The eyes of these young men were all open. The youngest was only 12 or 13 years old. They were dressed in jeans and coloured shirts, the material absurdly tight over their flesh now that their bodies had begun to bloat in the heat. They had not been robbed. On one blackened wrist a Swiss watch recorded the correct time, the second hand still ticking round uselessly, expending the last energies of its dead owner”. “On the other side of the main road, up a track through the debris, we found the bodies of five women and several children. The women were middle-aged and their corpses lay draped over a pile of rubble. One lay on her back, her dress torn open and the head of a little girl emerging from behind her. The girl had short dark curly hair, her eyes were staring at us and there was a frown on her face. She was dead”. “Another child lay on the roadway like a discarded doll, her white dress stained with mud and dust. She could have been no more than three years old. The back of her head had been blown away by a bullet fired into her brain. One of the women also held a tiny baby to her body. The bullet that had passed into her breast had killed the baby too. Someone had slit open the woman’s stomach, cutting sideways and then upwards, perhaps trying to kill her unborn child. Her eyes were wide open, her dark face frozen in horror”. The massacre shocked the world. Israel’s Prime Minister Menachim Begin was forced to resign. In December 1982, the UN declared the massacre to be an act of genocide (despite the fact that all Western democracies abstained on the vote). An Israeli judicial commission found that the Israeli military had abandon its duty of care and that Ariel Sharon was “personally responsible” for the massacre. However, neither Sharon or any member of the Israeli military or the Christian Phalange were every punished for the war crimes they facilitated and carried out. In 2001, the Butcher of Sabra and Shatila, Ariel Sharon became the Prime Minister of Israel. During his time as Prime Minister of Israel, Israel’s Occupation Forces killed more than 1,430 Palestinian civilians and illegally demolished.hundreds of Palestinian homes in the Occupied West Bank and Gaza. Sharon’s decision to unilaterally “disengage” from Gaza was not an act of peace, as Israeli politicians and much of the mainstream media have argued. Instead, it was simply an attempt to sure up Israel’s control of the Occupied West Bank and facilitate Israel’s ongoing colonisation of the West Bank and ethnic cleansing of Palestinians from the region. In 2005 he ordered Israel’s withdrawal of nearly 8,000 settlers from the Gaza Strip and the evacuation of four West Bank settlements, but during his term as prime minister, the number of Israeli settlers in the West Bank, including East Jerusalem, and the Golan Heights, increased from roughly 388,000 to 461,000. The transfer by an occupying power of its civilians into an occupied territory is a grave breach of the Geneva Conventions, and a potential war crime. Israel’s disengagement from Gaza did not end the occupation of Gaza, it just changed how Israel facilitated the occupation. Rather than carrying out an occupation by stationing troops on the ground inside Gaza, Sharon withdraw Israeli troops and turned Gaza into an open air prison controlled by Israel from the outside. Sharon’s brutality, cruelty and legacy, however, can not be whitewashed no matter how much Israel’s apologist try. In the wake of Sharon’s death, it is important that we remember and mourn Sabra, Shatila and Qibya and the thousands of others of who died at Sharon’s hands. However, even more importantly, in the wake of Sharon’s death, our resolve should be to take a stand and organise against Netanyahu and all those who continue Sharon’s legacy today. One way we can do this is by joining and actively getting involved in the Palestinian Boycott, Divestment and Sanctions (BDS) campaign against Israel. Demand justice, human rights and self-determination for the people of Palestine and boycott Israel.